MMOHuts has teamed up with Perfect World Entertainment to produce a Let’s Play series based on Star Trek Online, which is coming soon. Colton and myself, both admitted fans of the free-to-play MMO set in the Star Trek Universe plan to journey around the stars and tackle some of the communities’ favorite missions, as well as some of our own personal favorites. Though we plan on beginning in the “Discovery” era, creating Discovery captains and completing the most current story in Star Trek Online, the first episode of “Age of Discovery”. The way that this Let’s Play series came about is fairly interesting. I was doing a semi-regular live-stream of STO on Twitch (though we have moved back to Youtube), and I wanted to do a “Choose Your Own Adventure” style of stream, where the audience got to pick out what story I tackled. The downside to this, I needed a character that had already completed every story in the game, so I could go back and do them. This was simply not feasible with the time constraints in place, so I had a different idea: What if we just did a Let’s Play series, where me and Colton traveled the stars as a pair of woefully under-qualified starship captains and meted out justice, saved people, and hung out in a fun MMORPG? Sounded like a good idea to me. Perfect World was on board with us as well, and after some discussion, we had a plan! Star Trek: The Worst Generation is the tentative title of the series, and will likely air weekly/semi-weekly as time allows. We could have started at the very beginning of the game, which would be all-too-easy, but with Age of Discovery being here, it felt right. It’s such a cool thing to see an MMO with a story set in the current-era of Star Trek. When I was a kid, I’d have given anything to be able to play a game in Star Trek: The Next Generation. The Star Trek NES games were not particularly great. 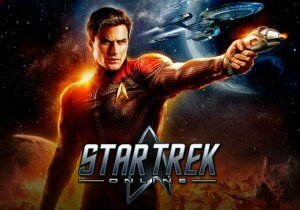 But to be able to play a Star Trek game in the currently-airing story, with friends? That’s such an incredible thing to be able to do. I’m terribly excited to do this for a variety of reasons. The first being, I love Star Trek Online. It’s a quality MMO with a terrific IP, given great care and treatment by its producers. The people who work on it very clearly love Star Trek as much as the people who play it do, and that’s important. The second being, we have not recorded much content as Bottom Tier (myself and Colton) in a very long time. This sort of stuff is really enjoyable to do, and being able to do it in an online game is even better. It’s not one of us sitting out while the other plays, we get to work as a team, and kick the stuffing out of whatever faction is our enemy at the time. The final thought being, we’ve wanted to do more interesting, “funny” content for MMOHuts for a while, and it’s a nice middle ground between my livestreams, and Colton’s solo first-look videos. Though producing news is enjoyable, sometimes we just want to do silly stuff on the Internet for the audience we love creating content for, and this could be the start of that. So if this one goes well, viewers can look forward to perhaps other series like this in the future for MMOs we enjoy/the audience enjoys. At this point in time, we have no estimated episode count for this series, as we have only recorded the first episode (is it gauche to call it a pilot episode? ), and plan to do many more as time permits. We have some other plans for this series too, such as pairing episodes with giveaways, maybe having some of the Star Trek Online developers/loremasters to come on and explain just how little we know about the series we’re diving face-first into. We’re all very excited for this to launch, though. We do not have a date for it but hope to get it going this week or next week, with many more episodes to follow. I can’t wait for you guys to see it. Heir of Light is receiving a new major update, entitled "RESTART", promising a fresh take on the game. The next phase of Early Access testing includes content updates with new vehicles, maps, enhanced rebalancing and retrofits.